John Frame’s new Systematic Theology starts out with a good point, one I’ve always (at least since reading Frame) felt is important: This is not Frame’s way of evading the careful spade-work necessary to form up a good theological definition. His book (I’m confident in saying, before reading it all) is full of just that. The error I think Frame’s thoughts help us avoid is one in which precise definition becomes a kind of idol: we can’t let ourselves think that the definition of “propitiation” is written on a golden tablet among Plato’s ideal forms. No, it’s a distillation of various Scripture passages written in various genres (prophet, Gospel, and epistle at least). Frame is also not saying that the work of systematic theology is so fluid as to be completely and permanent corrigible at all times. Good theology is a continual lap around three poles, the normative (what Scripture says), the existential (how I respond), and the situational (what situation I’m applying biblical teaching to). Within the normative perspective I may also be taking a never-ending lap around two poles (if only because I can’t think of a third): the general and the particular, or rather the forest and the trees. That’s a lot of running. And it means that no definitive theology can be written. Situations change; our understanding of Scriptures’ nuances, themes, and even language builds. 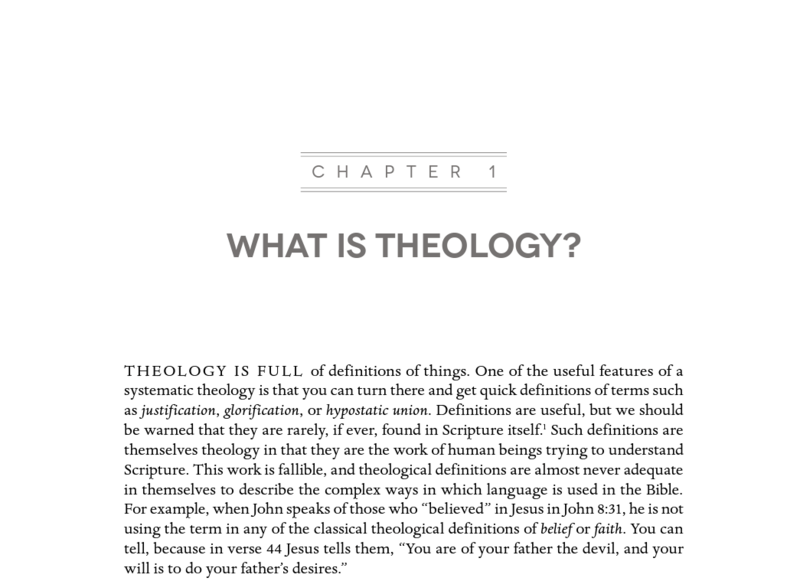 Anyway, I like a systematic theology that starts out with some good prolegomena on the work of definition.